I picked up this lovely jewellery box at my local charity shop yesterday, it was only £2.50! Which was quite a bargain, really, as this particular charity shop is usually rather expensive. I mean, they sell old primark clothes for more then they are to buy brand new, which is rather ridiculous. 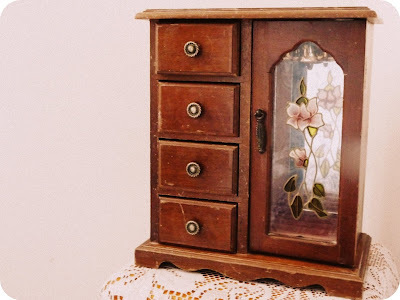 I assume the reason why they sold it so cheap was due to all of the damage, but that is the reason why i adore this box, which i have already filled up with my brooches, buttons, and a lovely pair of lace gloves my grandma gave me. I should be at college right now, but I'm feeling pretty ill so i'm taking the day off. I think the sicky feeling in my stomach is because i'm nervous, though. I have a college interview tomorrow morning, at the college where i'm currently studying a two year National Diploma in Art & Design, so I can hopefully carry on and do a one year Foundation art course, as I do not want to go university. I really do hope I get accepted, though I don't think I will (that's pessimism for you!). Wish me luck, I really do need it! Have any of you been going to interviews recently? Oh, and I know I haven't done an outfit post in a while, but I will definitely do one over the weekend, it's going to be around 22 degrees in London, cor blimey! Lots and lots of luck coming your way. I think you'll do great - you're fantastically talented, from what I've seen! This box is so lovely! And yes so bargain! I bought one, one day at the fleamarket, it was expensive. Good luck!! I'm sure you don't need it really. I'm looking forward to the amazingly hot weekend too! Gosh, you do seem to have some great charity shop luck, having had a scroll down! Thanks so much for your lovely comment, nice to see a fellow carboot loverrr. Your outfit photos are really well done, you're a talented lady!